The STAY Music Keyboard stand Tower Model is the cutting edge in keyboard stand design. Made of all aluminum, the stand is incredibly strong, able to withstand 264 lbs of weight. 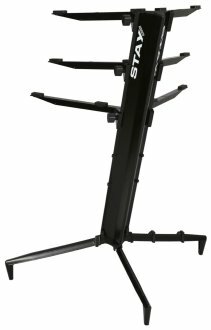 The two arm assembly comes with 1 straight base, 1 inclined base of 10 degrees, 1 pair of 17.7 inch straight arms, and 1 pair of 15 inch straight arms. Not only is the STAY Music stand strong, but it is incredibly stylish as well! Same Day Music is an authorized dealer of Stay Music products. Available until 11 PM (EST) today. Mention special code 1ZT-PZ4D when you call.